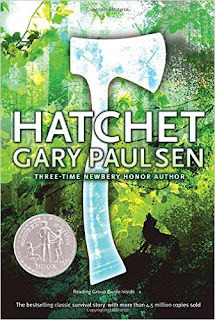 Review: My 3rd grade daughter was reading this in school and told me it was 'very violent' so I decided to download it and see what it was about. Brian, a 13-year old boy, is flying to Canada in a small prop-plane to visit his father when the pilot suffers a heart attack and the plane crashes. Brian, a city kid who was clearly never a boy scout, must figure out how to survive. This book is recommended for grades 6-8 and I'm guessing that is due to the multiple references to 'the Secret' and a reference to suicide. Essentially, Brian sees his mother kissing another man while she is still married to his father and that is why his parents are divorced. And there is one paragraph where he references giving up hope and trying to kill himself. That being said, my 8-year old seemed to brush over these scenes without really comprehending what was going on and focused on the survival aspect of the book. Although the writing was EXTREMELY repetitive, I enjoyed the core story of survival.